Whilst sitting here on a Sunday afternoon listening to ‘The Kinks’,I think it puts things onto perspective on living the alternative lifestyle. It’s also strange that a certain time of year can bring a flurry of activity. As we grow most of our food and all of a sudden you have a glut of produce, don’t have a freezer, so what are you to do with it all ? PRESERVE it ! Over the past few weeks I think that we have made a massive leap forward with our preserving and if we want to continue eating over the winter months then we have to preserve our food. 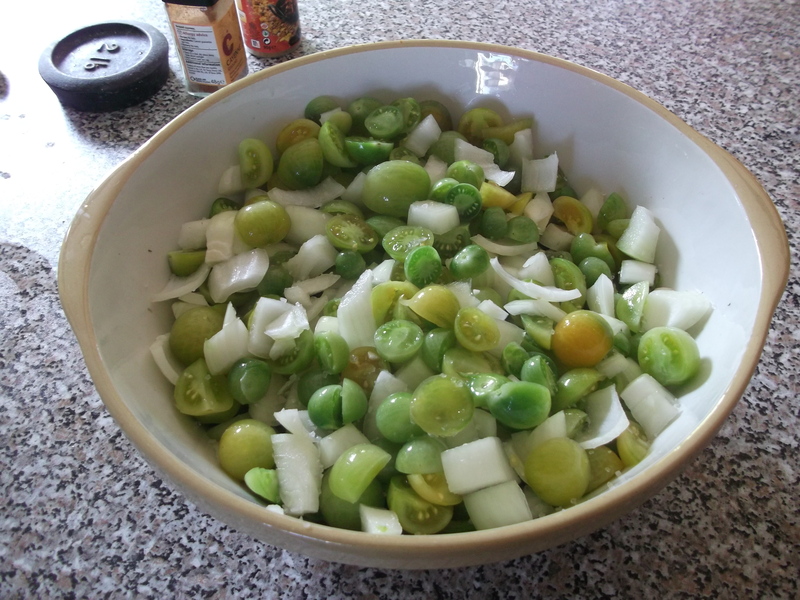 Last year we preserved our cherry tomatoes and they were very successful ( we actually opened one of our last jars yesterday and they were perfect for pizza topping) and so decided to preserve more this season, but as there were so many green toms this year ( due to a poor summer !) 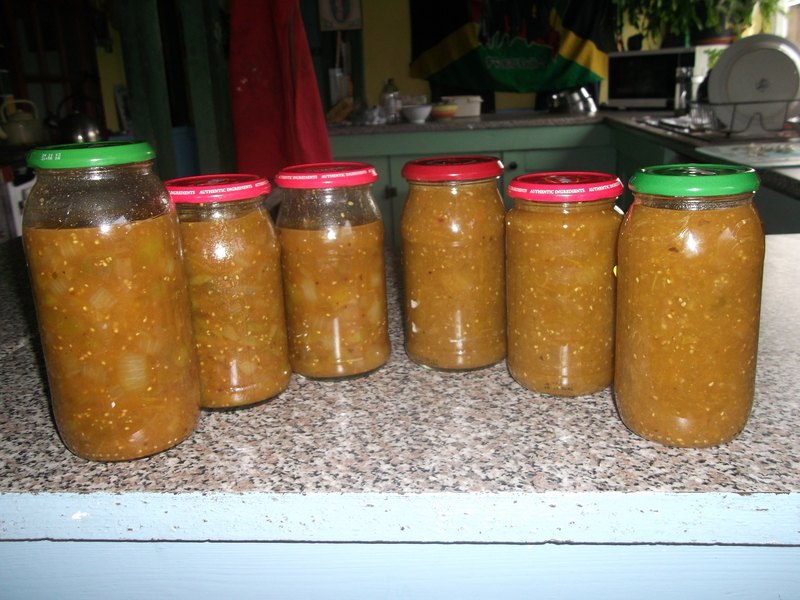 E found a recipe for ‘Green Tomato Chutney’ and when I walked into the kitchen (after working on ‘Bertie’ our VW campervan) all I could smell was a sweet and sour sauce. We’ve now decided to use all of our chutney as a sauce for chinese stir frys ( it tastes just the same!) and doesn’t have all of the chemicals used in commercial preserving. And so now here are the 2 recipes to preserve a glut of cherry tomatoes. Enjoy. First prick the cherry tomatoes with a cocktail stick and place a layer in a clean jar, sprinkle a little salt and sugar, some sliced garlic ( and a few basil leaves if desired). Layer some more tomatoes, salt etc until you have filled the jar and place the jar onto a cardboard lined baking tray, placing the jar lid on top of the jar but don’t screw the lid shut. Place the jar(s) into a cool oven for about an hour ( our Stanley range ) or until liquid is bubbling out of the tomatoes. When the liquid has almost covered the tomatoes, remove the jars from the oven and immediately screw the lids closed and leave to cool. Store in a cool, dark place. Wash tomatoes,peel the onoin and roughly chop both. Salt them and leave to stand overnight. The next day, drain off the liquid, stone and finally chop the dates. 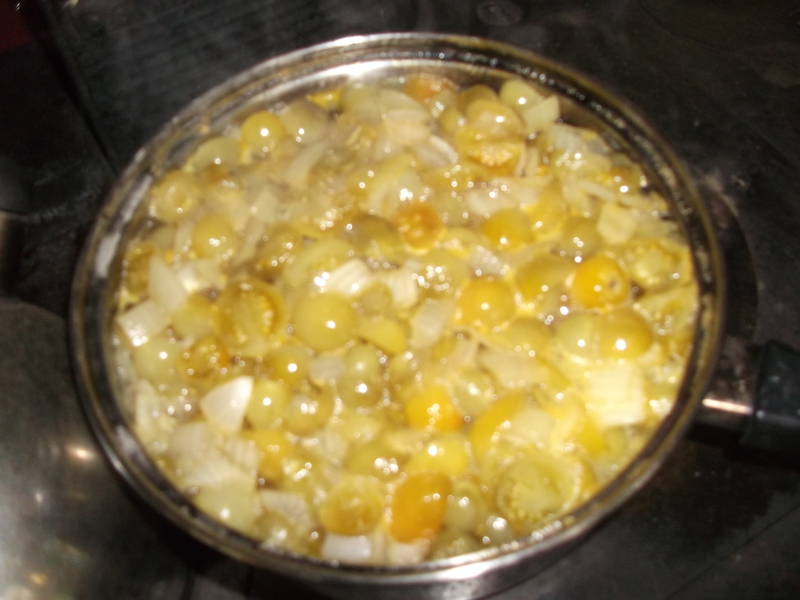 Mix them with the vinegar, sugar and tomato and onoin mixture, and bring to the boil. Simmer, without a lid for an hour, stirring occasionally. Add the mustard and spices after 45 mins. Boil over a high heat for 5 mins to thicken. 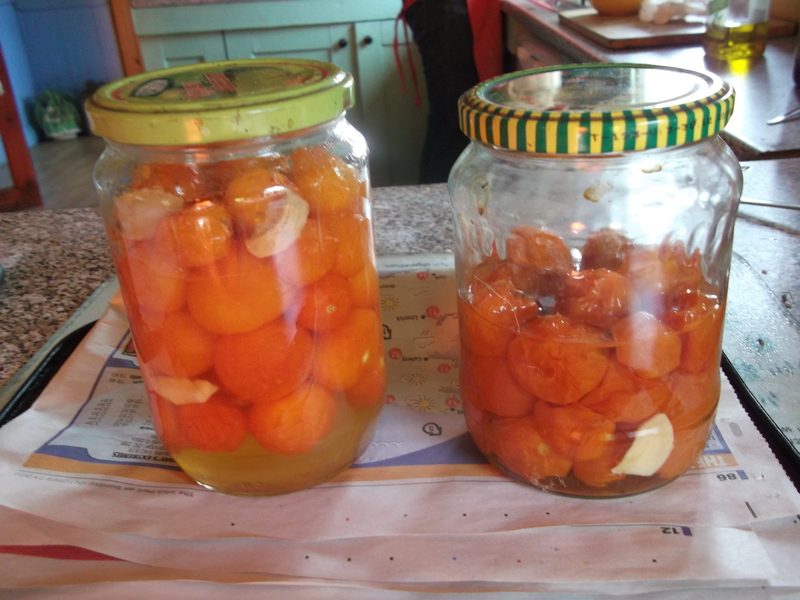 Immediately fill the jars with the mixture, seal tightly and stand upside down for 5 mins. Store in a cool, dark place. Willowarchway on A Strange Thing Happened. preciouspen1955 on A Strange Thing Happened.